​It’s a Bird, It’s a Plane, It’s Free Comic Book Day! 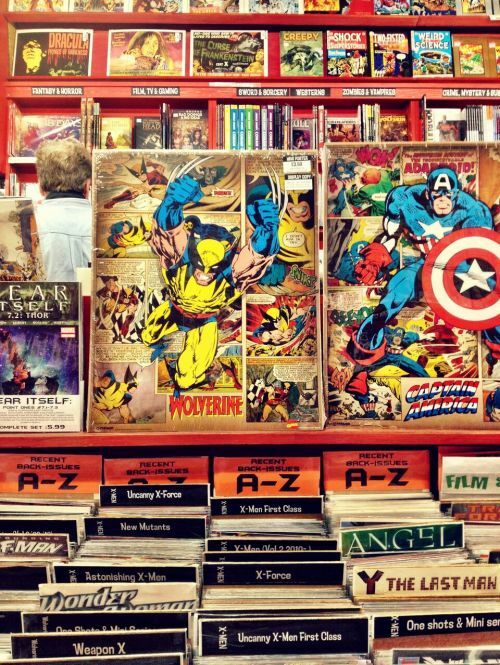 In the last century, comic books have gone from being a fringe medium of entertainment to a ubiquitous part of American pop culture and artistic expression. People from around the country (and around the world) immediately recognize images like Superman’s ‘S’ shield or Batman’s bat logo. Superhero films crowd the theatre marquees. Even as DC and Marvel turned their superhero franchises into blockbusters, smaller presses latched onto comics as a breathtaking and original narrative medium, expanding out beyond the typical men-in-tights fare. Comics have gone from something kids guiltily hid from their parents because they rotted their brains to a legitimate form of art. The medium has truly undergone a fascinating evolution and it’s never been a better time to publish and sell comics. However, the medium is so vast it can be daunting to a newcomer to figure out where to start. It is in that spirit and the desire to share something that has brought many such joy and entertainment that Free Comic Book Day came into being. About sixteen years ago, a California shop owner named Joe Field presented the idea for Free Comic Book Day to Diamond Comic Distributors, and the rest is history. Free Comic Book Day became a staple at comic book and gaming stores around the United States, where comic presses would distribute free samples of new and upcoming series in order to whet the appetites of prospective readers. Often stores would also offer deals on their other wares, bring in artists and more as guests, and have prize giveaways, a lot like a convention. Paradox Comics of Fargo has been participating in Free Comic Book Day since the beginning. Opened in 1993, the sixth comic shop in Fargo-Moorhead and a staple of the local comic community will be turning 25 in October. That entire time Richard Early has been the sole owner of the establishment. “We’re proud to have been here for a quarter century and think we’re only getting better with experience and age,” Early said. As the store has changed and adapted over the years, so has its approach to Free Comic Book Day. This year there are fifty different titles at the event, and only four of them are from comic book superhero juggernauts DC and Marvel. The event provides an excellent opportunity for smaller presses to gain visibility. The limit at the event at Paradox is five comics per individual or ten per family. Early sees the large selection of titles and small limit of what one can take away as an advantage, not a disadvantage. “The limit actually helps people make decisions and makes them focus more on the covers and the titles to see what looks appealing,” Early said. Paradox will also be presenting a guest this year in the form of Joe Caramagna. Caramagna, from New Jersey, has been personally involved with the Ronald McDonald House charity and made contact with Paradox through Fargo’s branch of the charity with the help of Erica Johnsrud and the rest of the team. The man has an impressive resume, currently writing for the “DuckTales” comics from IDW and an upcoming “Frozen” series by Dark Horse. He has also served as a letterer at Marvel Comics for years, working on titles such as “The Amazing Spider-Man”, “Captain America”, “Runaways”, “Ms. Marvel”, as well as the Star Wars-related titles “Doctor Aphra”, “Poe Dameron”, and “Darth Vader”. Early is obviously a veteran of many a Free Comic Book Day, so of course he felt he could impart some advice for those who might be new to the whole thing. The line is the longest between 9 and 11 a.m.
“But I recommend coming for that,” Early said. This year, Paradox plans to wrap up the line past the neighboring 20 Below Coffee and anyone who stops by there with a Free Comic Book Day bag can get $1 off their drink. Smaller press titles tend to run out the quickest. Also, be sure to pay attention where you park as things will obviously be quite busy. “On Saturday morning there are plenty of places to park right around us so make and take a look at the city parking map,” Early said.